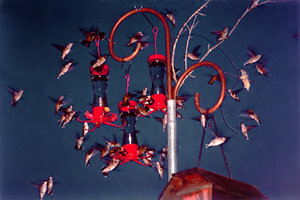 The 1998 meeting of Internet hummingbird enthusiasts was held in southwest Missouri. Photos were taken during the banding demonstration. Peter Schmidt has written a wonderful personal account of his first hummingbird visit, sure to bring back fond memories for most who read it. Georgia C. Spiller wrote a tale of rescue and wonderment that will make you smile as you share her joy. A poem by Laryalee Fraser.